Since Portia Moore's graduation a decade ago, this energetic alumna has channeled her initiative and horsepower into an innovative business venture that is positioning children for educational success. 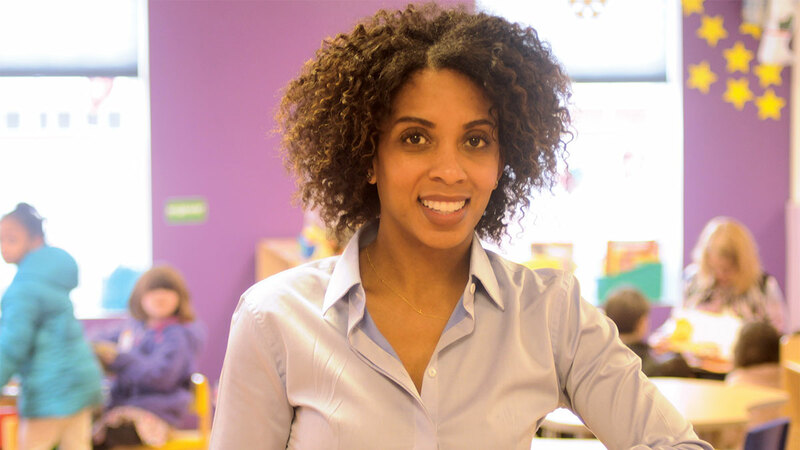 Moore is founder of STEM Preschool LLC, a unique early-childhood development enterprise with locations in northern Virginia and the District of Columbia. STEM Preschool teaches students science, technology, math, and engineering principles through their early development, helping them to cultivate confidence and competence in these subject areas by the time they enter elementary school. Last spring, Moore earned the Virginia Tech Alumni Association's Entrepreneur of the Year Award during the university's Black Alumni Reunion. How did you decide to work in the field of early childhood education/development? My educational background and early work experience inspired and qualified me to pursue my dream of owning and developing what is now a STEM preschool. While finishing my bachelor's degree, I worked at a day care center caring for and teaching young children. Afterwards, I pursued my master's degree in education at Marymount University. Why is it important to you to teach a STEM-based curriculum to children early in their development? It is my opinion that children who are exposed to STEM early are better prepared for kindergarten and can continue to enjoy these subject areas throughout life. I love to see the development of children as they navigate this world as tiny humans. One can learn so much from children at this age because their perspective is untainted and genuine. How did your education prepare you for this work? My education at Virginia Teach was diverse and difficult, which I believe made a huge impact on my ability to keep growing, learning, and navigating the more complicated circumstances that adulthood and business ownership can bring. My parents and my grandmother are my role models because they have always put healthy pressure on me to succeed at whatever I set my mind to. Their enormous support and encouragement allowed me to quit a teacher's aide position to pursue my dream of owning a preschool. Have your students surprised you in some way? Do you connect with other alumni? Yes, I do. I was humbled and surprised by the Entrepreneur of the Year award nomination because a lot of the time you're doing your thing, and you have no idea who is noticing your work. I look forward to being able to share that same energy with other alumni to keep the Ut Prosim (That I May Serve) energy alive and well in all of us! Let's go, Hokies!